Sometime in the early eighties, my family took a car trip from Oklahoma City to Albuquerque, New Mexico for New Year's holiday. We had a great car trip, a great time, and it is all a big happy memory. As we drove along in the dry, flat, featureless plains outside of Amarillo, I looked over to see a whole row of antique Cadillacs buried in a wheat field. The site had been mowed, so you could see the cars. I was so impressed that an artist would take the time to crease such a spectacle with no fan fare, no signs, no credits. I hollered out and we pulled the car over to the side of the road and got out to stare. We couldn't believe our eyes. It was wonderful, strange, and crazy. We loved it, and I loved the artist who shared this with all of us driving along that very boring stretch of Americana. The pictures of the Cadillac Ranch installation which I found on the web this morning include cars painted with years of graffiti. When I saw them, I don't remember any graffiti, just a long line of beautiful antique cars planted in the field bent over like wind-blown corn. Today in the New York Times, there is an article about people who are giving up their dream SUVs because of the price of gas. They call it Putting the Dream Out To Pasture. They have illustrated with a picture that is a clear reference to the original Cadillac Ranch, which I don't believe many people know about. 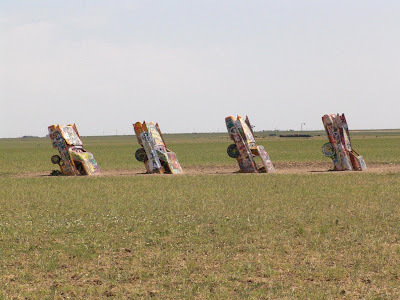 Cadillac Ranch: I'm amazed and grateful that I saw the real thing! Safari was originally named Holly. It occurred to me to call her Holly Safari, but that is a little too much. She is a scardy cat. The foster mom explained that when the kittens were just a few weeks old, another foster mom let them have the run of the house, which is not a good thing. The vet visited that foster mom to give them the shots, and called the shelter to say that these kittens should be removed to a home where they are confined to one room. So, they were moved to the next foster home, where we met them. They lived in a large room with five or so other kitties. Through all of this, Holly (Safari), became a scardy cat. When we first met her, we had to try pretty hard to catch her and hold her in our arms. When you picked her up, she would sit quietly and purr lightly. It wasn't that she didn't want to be held, it was that she is afraid of those big hands coming to get her. We knew that in order to make her into a lovely house cat, we would have to work with her patiently and get her to trust us. Today, Safari was laying quietly on the kitchen floor, and George reached down and petted her as she lay there. He didn't try to pick her up, he just reached out calmly and stroked her from head to tail several times. This is a big step for Safari. Holding her on your lap is no problem, and she will stay calm, and purr quietly, but laying there and not being afraid of his hand coming at her is a very very big step. She is learning that we love her, and that even though she has a big brother who climbs higher, catches faster and purrs louder, she is every bit as important to us and we love her just as much. I took this picture to show how beautiful her striped tail is. She has wonderful markings, a calm manner, a quiet ladylike purr, and she pays a lot of attention to details. We know now that only one in a thousand orange cats is female. It will be wonderful helping her not be a scardy cat. We have had the kittens two weeks and I think they have doubled in size. They are growing, which is what I expected after they had good food, lots of play, and two people who love them. Safari is coming around. She is not so afraid, and she lays right in the middle of the kitchen and lets you walk around her. She is home. Simba is our fearless leader, and jumps to the top of the kitty condo and with paws hanging over the side, is king of all he surveys. They are breathtakingly beautiful to look at, and as they fill out, and their fur gets longer and prettier, their stripes show up more, and they are just awesome little cats. Am I prejudiced? No. We go to bed a little later, and we get up a little earlier to be with the kittens. It has been a big change in our lives. It won't be this way forever, but for now, until the kittens are acclimated and we are sure they are safe, we stay with them most of the time that they are not in their playpen/cage. Safari likes to go into the silk colored bag that we bought and play "mouse" with George. Simba likes it up high, where he can grab at the feather toy and almost always catches it. His reflexes are perfect, and what he wants, he gets. Simba can climb anything, but Safari has more trouble pulling herself up to the top of things. She is content to stay below most of the time. I make sure that she is included in all our games, so that Simba doesn't get the best of her. They are so different, it is really interesting. They roll and wrestle and have a good time together. What great kittens. I feel so lucky to have such beautiful cats in the house. More tomorrow. Have a good day. Happy Friday. In the morning, I let the kitties out of their play pen, and stay in the kitchen with them for a quiet hour. Ha. Today they were far from quiet. They had a steeplechase all around the kitchen, jumping over food bowls, landing in water bowls, and going over one obstacle after another. They were clearly getting their exercise after a long night penned up. We never hear a peep out of them in their cage at night, and many times during the day they go in there to sit up on the shelves or play on the floor. There are big differences between Simba and Safari. Safari likes to root around on the floor looking for the stray small ant, or finding little bigs of fluff or paper. She is the follower. Simba is the alpha male. He likes to climb and is darn good at it. He already knows how to get to the top of the cage, (which is five feet high), in three steps. He sits on top and meows at me, triumphant in his success. They are playful and fun. George and I take turns sometimes being in the kitchen with them so we know they are not getting into trouble. Little noises are a very big deal. They hear George coming down the hall and wait for him at the door, and then when he steps in they run. It is a game. They listen to teapots, birds, squeaky toys accidentally stepped on, dropped beads...anything that might mean a little extra fun. We are doing well with our kitties, even though they take up a lot of time. I'm happy that my jewelry table is right there in the kitchen too, so I can work while they play. It is a big world in that kitchen! The kittens are staying in the kitchen for now. Life is good. A pop bottle cap can provide endless entertainment. Today I put the circle blue plastic wrap off a milk bottle cap and tied it to a string. We had fun for an hour with that! They have bouncy toys, a ball of yarn, feather mice, measuring spoons, and stuffed moose as playthings, but their all time favorite toy is a feather thing attached to an elastic cord, which is attached to a stick. Thank God for that little black stick. The kittens fly at the feather with all claws out, and my legs are 4" away. It is inevitable that I am going to get scratched in the melee, but...right now I don't care. When I play on the floor with them, I cover my legs with newspapers, and that seems to work fine, and adds a little crunch as they land as well. It is a high time in the kitchen every morning, every evening, and several times a day as well. Both of them can jump as high as the kitchen counter, and twist in the air, and come down on all fours. Sometimes they come down on their back, but it doesn't seem to faze them. Playing together is fun. Sometimes Simba gets the better of the feather game, and Safari has to stand back and wait her turn. 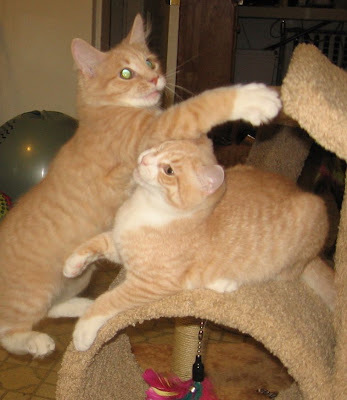 We saw that at the foster mother's house too, when our kittens stood back and waited their turn while the more aggressive older kittens batted and played. They are really sweet kittens. Food doesn't seem to be any problem for them. In fact, I'm a little worried that we have gone through half a bag of dry food this week. They get a cup at a time, and they finish off one during the night, one in the morning, and at night they get a small can of kitten Science diet. They have grown, and sometimes they look so big to me, but when I hold them in my arms, they seem much smaller. They hide their heads under my elbow as I comb and brush them. Grooming is important, and these kittens get brushed several times a day, and I'm going to clip their nails once a week, starting today. I'll report later how that goes. Today is going to be 93 and humid. I have the air conditioners going, and intend to lay low and make jewelry today. It is high time. I have 13 special orders, and today is the day I have to finish them. Tomorrow is church, and then who knows what. The summer is here, finally, with the kind of weather you think about when you are shoveling snow. The birds outside need fresh water, so I gotta go. This has been a strange summer for blogging. My mother got sick in April and was hospitalized, and then again in June, and I rushed from the Milwaukee Bead Show to Oklahoma. I stayed three days with her at Baptist Hospital, until she was transported to a longer term specialty hospital. She was getting good care and gaining strength every day. When I came back to Boston, life sort of returned to normal, which means that I worried a lot and went to work every day. I consulted a counselor about how to separate myself from my mother enough to enjoy my own life. I let the family know that I was planning to go on vacation and we did. George and I just returned from our vacation in New Hampshire; six days of fun at the cabin, fishing, playing cards, reading, resting and cooking good barbecue. It was fun, and I talked to my mother once while I was away. She was doing well. She is now at Grace Living Center in El Reno, which is a skilled nursing center near her home, and coping with yet another change. At 98 years old, I guess change is something you are very familiar with. So now I can blog again. And I have a great subject. George and I got two new kittens. The adoption process was a month long and scary. The agencies are careful, and each has it's own style. After weeks of looking at pictures of cats, I had sort of given up and was just coasting along with the idea in the back of my mind. I felt that when there was a cat that was meant for us, he or she would just turn up somehow. 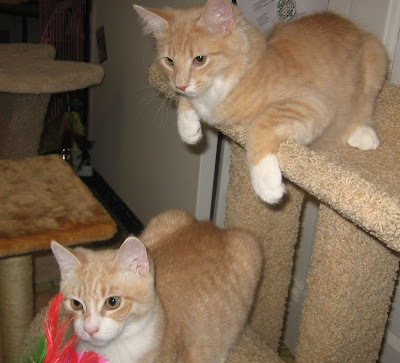 I was looking on the web one day at Petfinder.com, and voila, I saw the kitties I wanted. 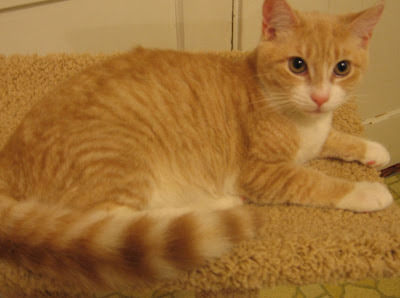 I love orange and white and had given up on getting an orange and white cat because they are rather rare. I was also hoping to adopt a cat that didn't already come with Feline Leukemia or other health problems. I saw this picture of "No Names", little buff and white kittens, and fell immediately in love. I had told myself that I would never fall in love with a cat over the internet, which is a good way to get your heart broken, but I fell is love with both of these beautiful kittens. We went through the adoption phone calls and paperwork, then went to meet the foster mother and kittens. It was an amazing experience and I have so much respect for people who open up their homes to foster cats, and who spend such a big part of their lives caring for animals. The kittens were all beautiful and well cared for, and none of them had medical problems. 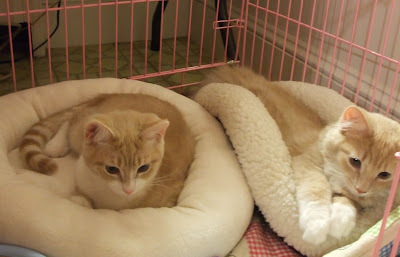 On Friday, July 11, my birthday, we brought home two fawn and white kittens. They are already 14 weeks old, so they are getting big already. After thinking of 1000 names, I have settled on Safari for the girl, and Simba for the boy. There are a lot of really great cat names, and creativity got the best of me, but these seemed simple enough and charming enough to suit these very beautiful kittens. Today we made big strides. They have explored the kitchen, which is their new temporary home. Kittens need to be in one room, with doors, so they don't get the run of the house and go wild. The three storied cage gives them respite from the outside world and makes them feel cuddled and safe. It is also a safe place to leave them when we need to leave the house. The adoption agency gave us the huge pink cage, a beautiful bed, two bags of food, and a whole bag of stick and feather toys and other little toys. They were MORE than generous and very kind. We have turned the kitchen into a cat house. I have swept and slicked it all up so there isn't anything dangerous for them to get into. For now we are doing well. They are far less scared today than yesterday, and they purr and meow and poop and eat and play with toys and do all the great things kitties are supposed to do. You'll be hearing a lot more about these two! 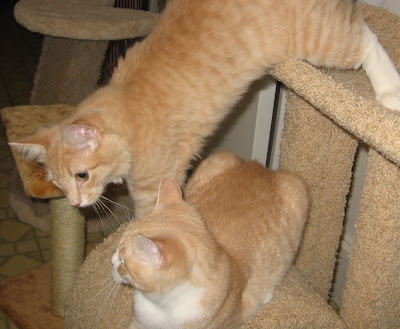 Welcome Simba and Safari, to your new loving home. You will never replace Thunder, but you were never supposed to.